Kenney was an English dramatist, the son of James Kenney, one of the founders of Boodles’ Club in London. 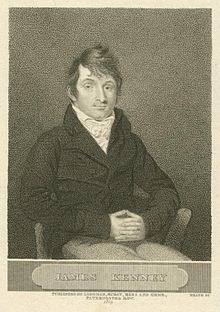 His first play, a farce called Raising the Wind (1803), was a success owing to the character of “Jeremy Diddler”. Kenney produced more than forty dramas and operas between 1803 and 1845, and many of his pieces, in which Sarah Siddons, Madame Vestris, Maria Foote, Monk Lewis, John Liston and other players appeared . His most popular play was Sweethearts and Wives, produced at the Haymarket Theatre in 1823; and among the most successful of his other works were: False Alarms (1807), a comic opera with music by Braham; Love, Law and Physic (1812); Spring and Autumn (1827); The Illustrious Stranger, or Married and Buried (1827); Masaniello (1829); The Sicilian Vespers, a tragedy (1840). Kenney, who numbered Charles Lamb and Samuel Rogers among his friends, died in London in 1849. He married the widow of the dramatist Thomas Holcroft, by whom he had two sons and two daughters.